Approximately 3 Peters will give you the best night of sketch comedy in this city for five bucks. Possibly for any amount of money. Billed as "sketch comedy for the nerd in all of us," the trio of Second City Conservatory Program graduates celebrated their "thirdaversary" of their once-monthly get togethers, performing their 14th show at The Cameron House back room last Tuesday. "Are you pumped for tonight?" asks Ian MacIntyre, 26 (the approximately third Peter) as the three performers hit the stage. A big cheer resounds in the audience. "That's the sucrose high!" chimes in Pete Hill, 31, not missing a beat. He's referring to the effect of the free McCain Double Chocolate Cake that's doled out at the door to help celebrate the occasion. Starting off the evening is the comedic improv duo, 10,000 To Flight, comprised of Mark Andrada and Julie Dumais. They take a suggestion from the audience of "an event that you would not normally celebrate the anniversary of," which ends up being a haircut. This transforms into the couple sitting in an Iroc, having a few drinks, prolonging the inevitable family gathering. As each latecomer who enters the venue through the curtains and past the stage, instantly becomes a member of the family, and the stories got more intricate and involved with each person who wanders in late. Andrada's quick-wittedness makes for some particularly amusing moments and keeps the crowd laughing. Yet he maintains character throughout. 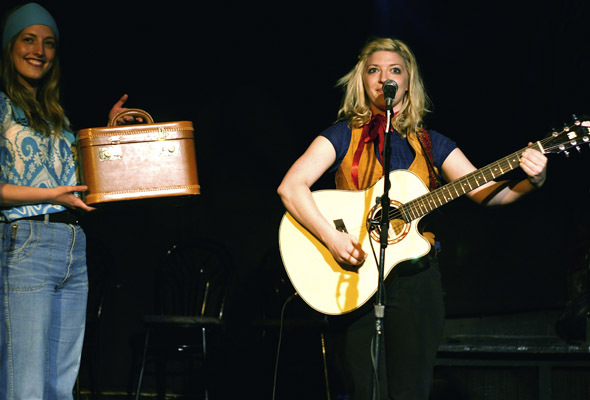 Next up is Charity & Chastity, a musical duo featuring Chelsea P. Manders and Ingrid Haas, two blondes with an acoustic guitar and a magical suitcase full of surprises. Among them, a set of authentic Brazilian mini maracas, "bought in Chinatown" and a mini bongo drum she "won bobbing for bananas at summer camp." Each instrument tells a story, which is revealed in witty banter, full of sexual innuendo. The suitcase later reveals a mini tambourine and a melodica. About the latter instrument, Chastity comments to Charity, "It includes blowing, so I'm sure you'll find it easy." The Approximately 3 Peters started their monthly performance on the Third Tuesday of the month at the Rhino Laugh Lounge three years ago. Peter Gal, 28, the taller of the approximately three, brings his captivating stage presence to the group. Combined with good writing, the Approximately 3 Peters deliver a tight performance. The evening's sketches included a Harper vs. Dion/Layton Political Feud game show and a '60s political flashback. But their most memorable sketch comes at the end of the evening in a seance routine where all three take turns being possessed by their dead drinking buddy. Everybody needs a good laugh every now and then. Now Toronto's got a new venue, The Comedy Bar at 945B Bloor Street West (at Ossington), co-owned by Gary Rideout Jr. of The Sketchersons. Looks like I'll have a lot more laughs ahead. PROJECTproject's Combustion Festival starts there on Monday and will feature shows every night of the week.